This photo was taken off Fairport Harbor, OH. 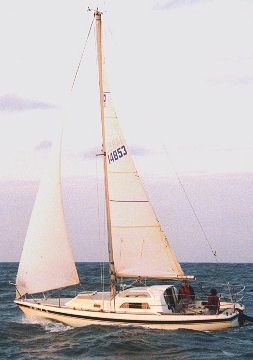 We were sailing in 18-23 knots and 3-6 foot waves with working jib and full main. We were making a bit better then 6 knots on a close reach. After the photo we tacked and headed in on a beam reach making 6.4-6.7 knots. The boat balances beautifully in these conditions. We can always trim out the weather helm with the right sail combination. The full main was no problem in this wind but a reef would probably help if we were close hauled.